Not the most exciting thing but did get the spark plug wires all put together - cut to custom length with proper terminal ends. Many obstacles overcome, still more to go. New pump was purchased and super-carefully installed. All lines cinched up, and no leaks after a couple weeks, yay! Still have to see how it holds up under the pressure of real use with the pump cranking away, but so far so good. This was due to an incorrect flex line in the rear - correct part ordered and installed, and the brakes were bled, no leaks! My brake bleeding assistant, who's never driven a manual car, had some trouble with my instructions to "push the pedal in the middle" - since the throttle pedal was sunken to the floor, the clutch appeared in the middle of the e-brake, clutch, and brake pedals. I'm going from corner to corner, wondering why fluid is barely eking out as I hear her pumping away! 🙂 A little revised instruction and it's good to go. Still had some air after a couple passes, at which point I realized the multi-piston Wilwoods need to be bled at the top of both caliper halves (inner and outer) to get all the air out. Last few bubbles gone and the brake pedal feels very firm inside. This was a rather labor intensive process. In typical easier-said-than-done fashion they were cut down 2.25" in length; bushings were trimmed or hogged out to fit appropriate sleeves for mount bolts; the front spring eyes were flipped and ground for clearance; initially the rears were flipped also but it looked like clearance would be an even bigger problem, so they were left upright, but still got some grinding. This has an ultra-scientific "one to two finger gap" in the rear. Added about 65 lbs. of fuel (more on that later) which only brought it down about 1/8". Only weight left to go in is the headliner and door glass, so this is where it'll be for now. It's not likely this spring rate will be the one I wish to keep forever, so for the next pair of springs, it should be easy enough to request an additional ride height decrease, in addition to the spring length decrease. Bushing work will swap over. 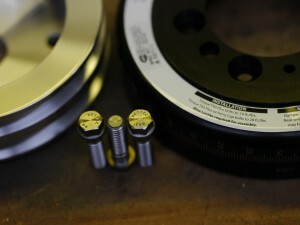 Oh, and in the picture above, the rear wheel has 3/4" of spacer. There's room to go inboard or outboard bit if needed, but this provided a more athletic appearing stance, while still providing for tons of wheelwell clearance in all directions. At this setting rear track width is 70.75", which still, isn't *that* wide. It's about 4" wider than my 240sx was, and about 7" narrower than the Viper. 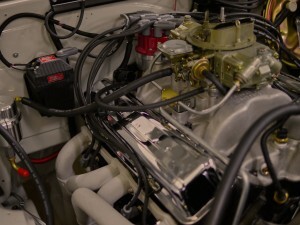 You may note, the stock-style valve covers. These are actually the third set of valve covers I have for this thing - the first set didn't fit the bolt pattern (they're for an even older small block) and the second set were a bit bigger and made of thicker material. They *look* nice and original, but caused all kinds of interference problems with things like the fuel line and the bracket for the power brake booster vacuum line, visible above. While in general I'm not a fan of extra chrome, these are at least very lightweight, and totally stock. This problem begat a bevy of tool purchases. After nothing could convince the old plug to come out, began drilling with ever-larger holes. The largest thing I had on hand for going through metal was 3/8" (bits and chucks), so it was time for some upgraded hardware. Now have a new 1/2" chuck drill, and an array of drill bits up to 1" in size. 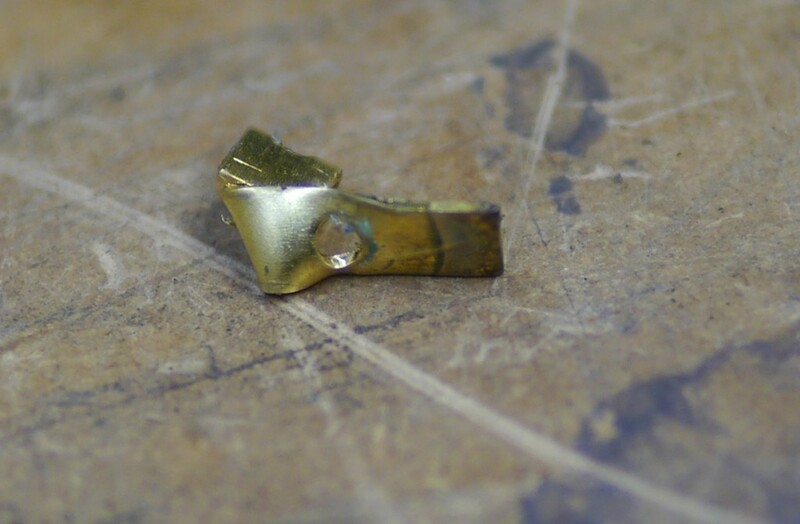 Also bought a 1/2" NPT tap to repair the threads, and a special 45/64" bit as the final pass before using the tap. 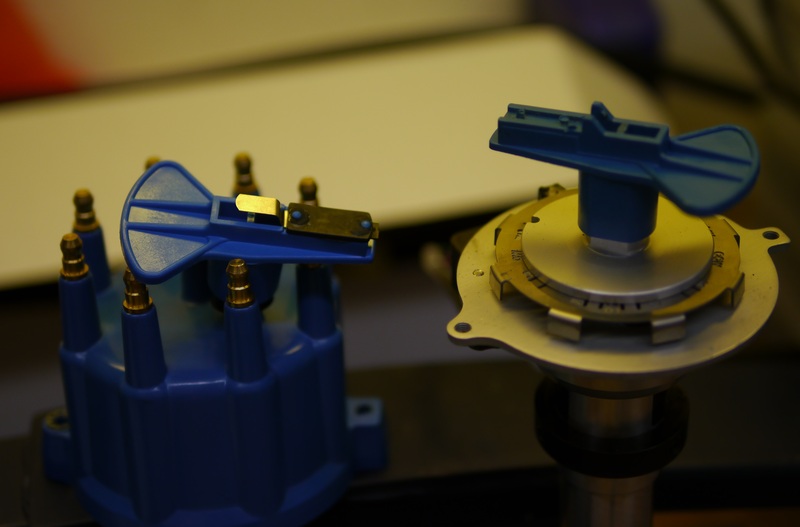 After using the 45/64" bit, all that was left of the plug was like foil and I could pull it out with needle-nose pliers. Hooray! 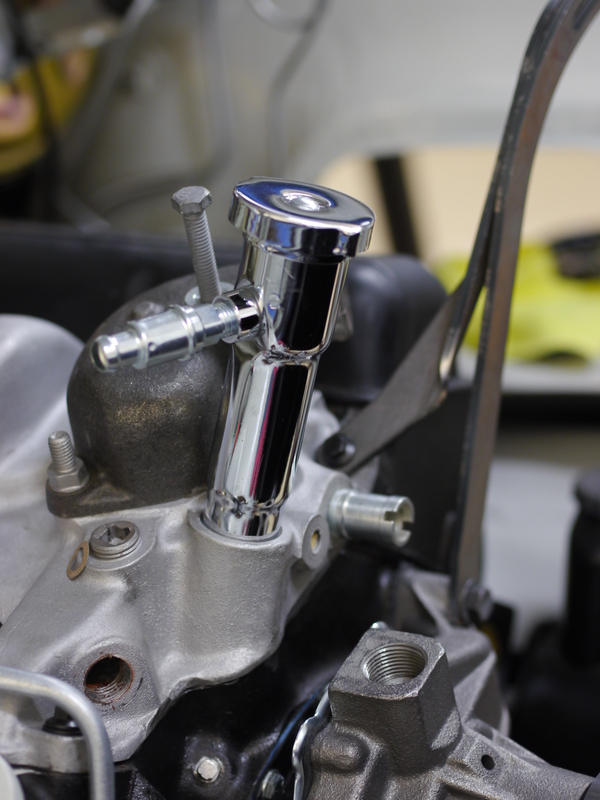 Coolant temp sensor in its appropriate location! Also visible in this pic, is the new oil pressure sensor. 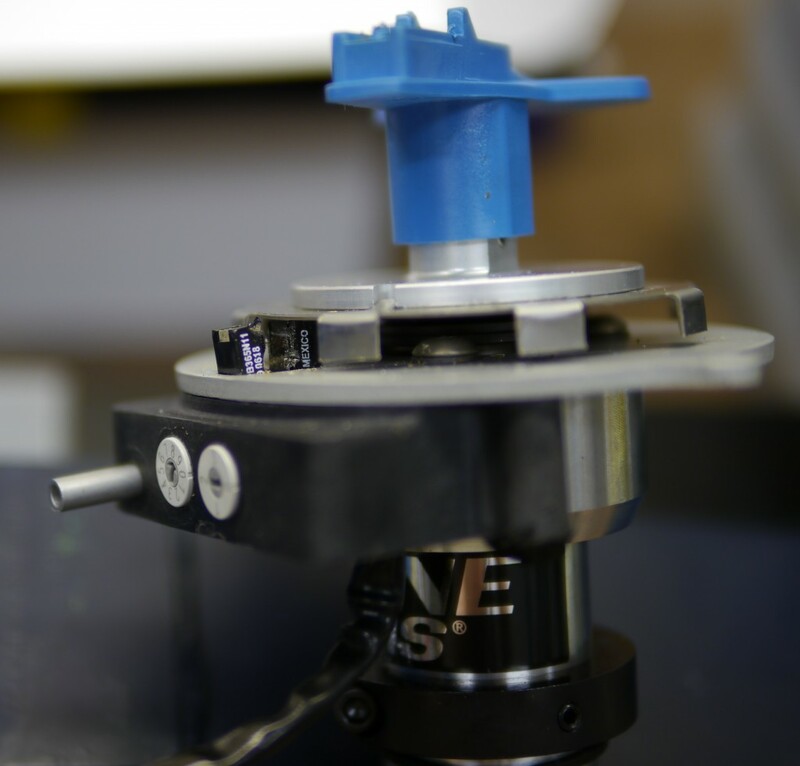 This is a 1/8" NPT sensor occupying a small port in the block previously filled with a small square plug. This too necessitated some tool purchases since it was a 7mm square plug, so none of my 6-point sockets would fit it, and the only way to fit a wrench on it, would be to pull off the water pump; no thanks. Ended up buying one of these universal socket things, advertised to work on 1/4" - 3/4" bolt heads of all shapes and sizes. After some monkeying, it got a grip on the thing and got it out. The tool earned its keep in that one action! 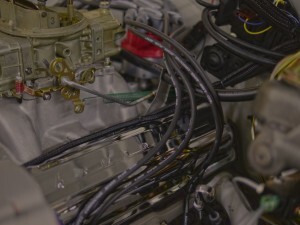 Perhaps apparent from the way the wires for the oil pressure sensor have been run, am making a big effort to keep the wiring tidy and professional in the car. Bought a ton of heat shrink tubing and overlay sheathing, in an attempt to keep everything clean, bundled, and protected. No progress on here from last time. The passenger vent window is just about ready to go in, been focused on what's needed to get it running. Lots of other progress has been made in addition to getting the above accomplished. 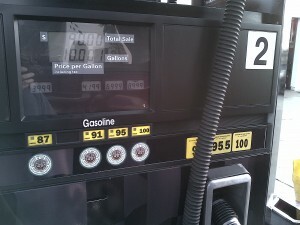 One of the simpler ones - the fuel line installation was completed, so it made sense to get some gas. We happen to have a very neat retro gas station just a few miles from the house, that sells all sorts of good gas right at the pump, and comes complete with a smiling young man offering to clean your windows or check your oil. It's mostly frequented by the well-to-do'ers of RSF, topping off their Range Rovers and exotic sports cars. I felt out of place with two crummy 5 gallon plastic jugs in the pickup, but the Camaro will look right at home there. This is another that seems like a no-brainer...which of course wasn't. 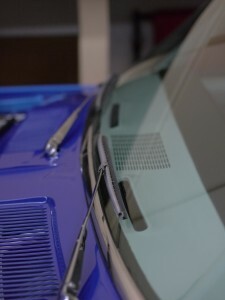 Had the body shop install the wiper motor and attach to the wiper arms at the body shop, as doing so requires having the cowl panel off, and installation or removal of a body panel, is a big opportunity to scratch up the paint on said panel. Unfortunately the wiper arms were not "clocked" to the motor correctly, causing the wiper blade to want to swing down initially, instead of up. So off came the cowl panel, some time spent futzing with the mechanism orientation, but ultimately, the wipers made it in, and I managed to get the cowl back on without messing anything up too badly. The car had no wipers when I got it, now it has working ones, ha! 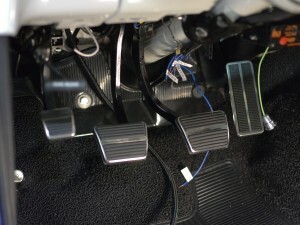 The car has four functional pedals at last! Well, the gas pedal may not make it go yet, but it does open the throttle, now that the road draft tube shenanigans were handled. 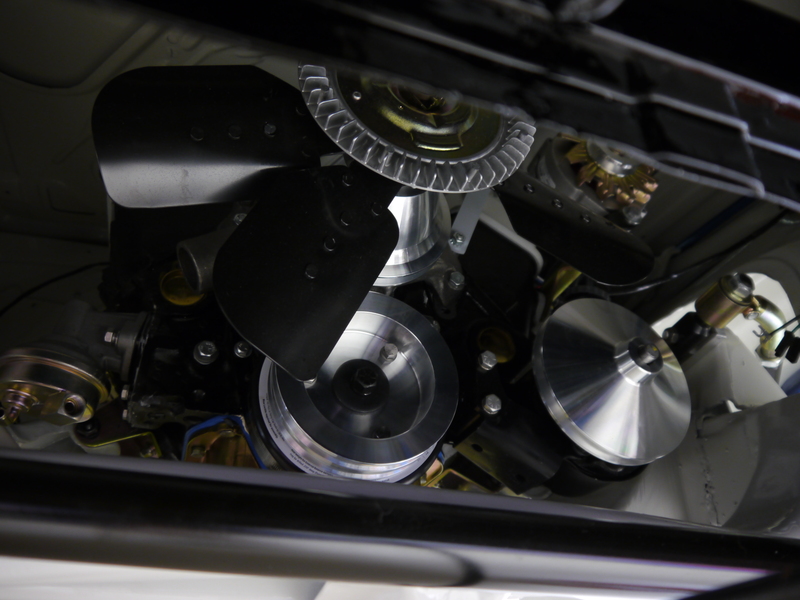 Brakes were made ok with the bleeding a little while back, and the clutch was okay, as the pressure plate provides most of the springing, but the complementary clutch return spring that keeps the pedal up against the stop, has also been installed. The parking brake pedal was the last to be made functional. 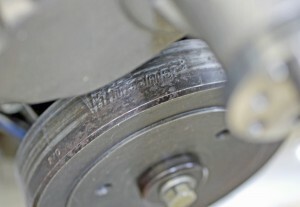 The Wilwood rear disc brake setup on the car has a complete functional parking brake, but comes without a means of adapting it to the factory cable system. Fortunately the solution was pretty simple, with a pair of Lokar "Explorer style" clevises, drilled out to accept the factory parking brake cable. The entire parking brake system is not entirely new, from the rubber of the pedal pad, to the drum lining at each rear wheel. As you can tell from the second picture, at this point, the exhaust ends at the mufflers. 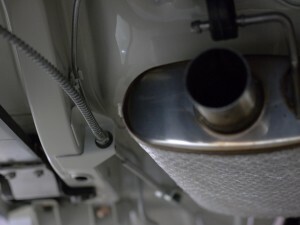 When I get the car to an exhaust shop, will have to see what can be done to extend the exit either to the traditional location, or out the sides. The panhard rod in the rear suspension complicates things. They still aren't right. Rear is too high, as discussed above. I've raised the front "2 turns" (haven't done the math to figure how that equates to inches), but it probably needs to come up more. This picture was taken a few days ago, before fuel and coolant were added, so both front and rear have since come down a little bit. You'd think moving the car around a garage floor on dollies like this would be easy - nope, big effort required! Before trying to drive it anywhere, I'll probably raise the front another 2 turns. The Vintage mags with 27+" tall tires will fill the wheelwells better than the Jongbloeds and AD08 rubber. 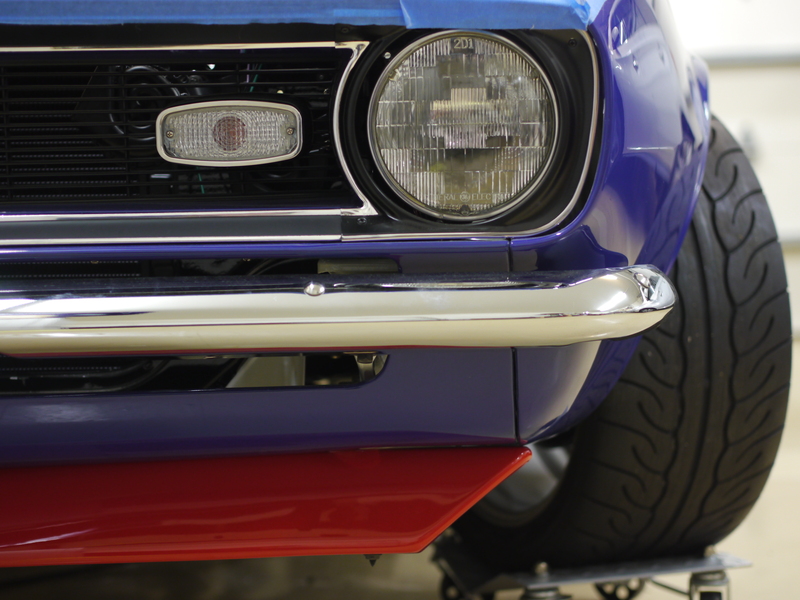 The shorter /35 series front tire vs. the /40 series on the rear, exaggerates the ride height difference. Pic inside of the front suspension with the wheel turned- contact point at extreme bump, is the lower control arm to the factory bump stop bracket, welded on the frame. At this ride height, it has about 1.25-1.5" of travel there, equating to about 2" of travel out at the tire. The family car had to go in for service (Infiniti is paranoid after the Toyota/Lexus unintended acceleration debacle, and is issuing recalls on the new JX35 like crazy. The car needed 5 recalls done, which necessitated an overnight stay) - and since they were busy and out of branded loaners, we got a crummy rental - the Chevy Sonic. The Sonic is one of these economical small cars - not micro like the Smart or Scion IQ, but subcompact like the Toyota Yaris, Mazda 2, or Honda Fit. When my Tundra was serviced I got a Yaris SE loaner, which was actually decent, but this Sonic LT was crap! Anyway, it got to park next to the Camaro one night. It only looks a few inches taller than the Camaro...until we see the Camaro is sitting on 5" tall dollies! 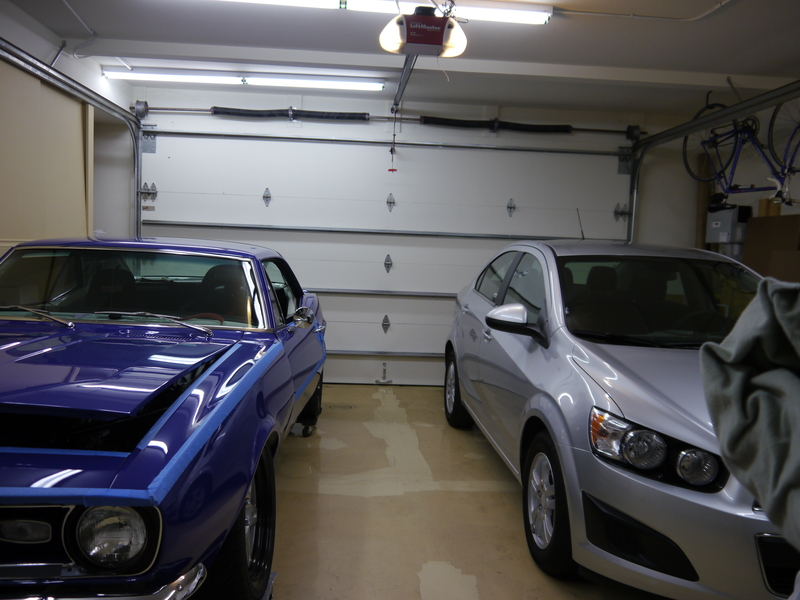 Will have to measure the Camaro once it's back on the ground, but I'm pretty sure its roofline is around 48", the Sonic (and lots of other cars like it) have rooflines about 60". Wow. Ok, so I put it in the trunk, not very exciting. 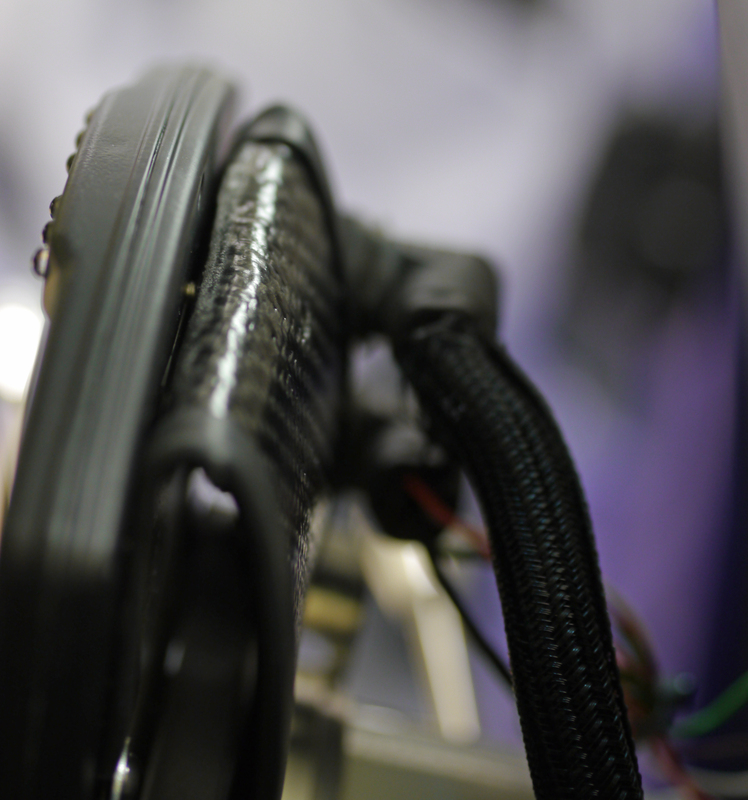 This is an Odyessy PC680, common in the aftermarket. It's 13-14lbs., vs the 35+ of the stock battery, hanging way out past the nose. Here's it's mounted fairly high, but more or less at the rear axle centerline. Have more thoughts on general battery placement, will have to share another time. 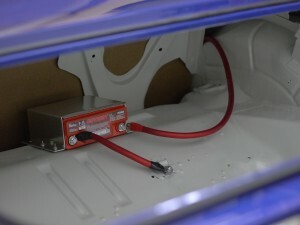 This battery was bought to get the car going (figuratively, not literally) - since in the beginning it is likely to get cranked a lot without much chance to charge normally, and this should stand up ok to that use. The *real* battery I plan on using is the C680 XS Power battery, which is only about 4 lbs., and is the same form factor as the PC680, meaning it will fit in that mount. The insides of the car received some attention, mostly in the instrumentation area. The wrap will come off soon! Still getting my hands dirty doing stuff, just not as bad as before. 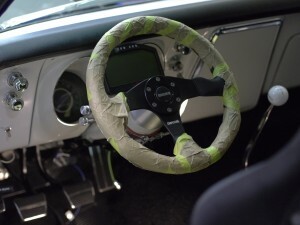 Note the cover plate over the center of the dash - bare as a no-option car can be. Couple other things to see - the switch at bottom left, and of course the DASH2 dash. The switch will be an independent control of power for the DL1 and DASH2. The idea is, I can keep it on, to help let the DL1 keep GPS lock between runs, or any other time I want to have the engine off but instrumentation on. Modern cars tend to have as their key positions, Off -> Accessory -> Ignition -> Run. This car has Off -> Accessory + Ignition -> Run. Want to be able to keep some of the electronics going, without all of it going. 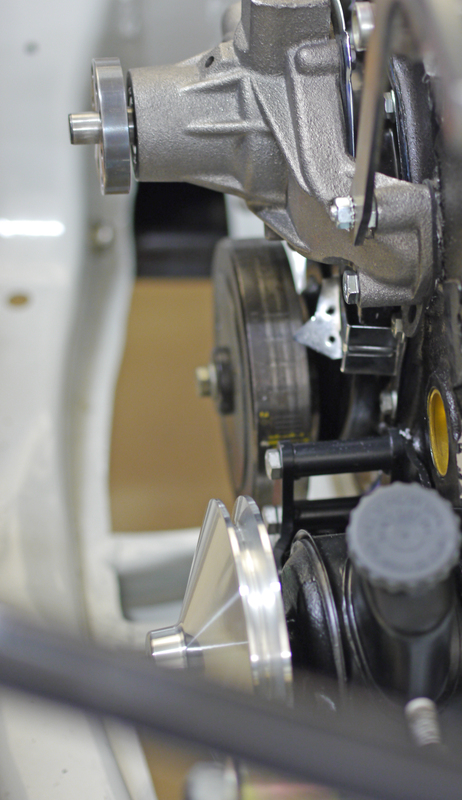 Speaking of the DL1, it got its own custom bracket, just below the dash, to the right of the steering column. That silly bracket took a ton of time to measure and bend up, and I'm still not totally happy with how it ended up, as I had to change its position slightly to avoid having to use a serial extender between the DASH2 and the DL1. 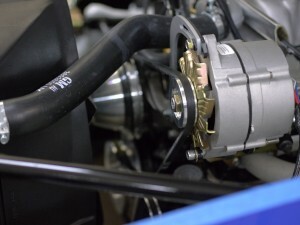 With this configuration, the DL1 will be recording information from sensors (like coolant temp, RPM, and oil pressure) in addition to the things it can figure out on its own - speed and accelerations - and present this data to the DASH2, as configured, over an RS232 serial connection. This is handy, because you can't really look at gauges while autocrossing. You might have a chance to look at the tach when doing an initial 1-2 shift, but that's about it really. On the track you can take a glance for a second or so while on a straightaway, to ensure systems are still healthy, possibly even changing your approach if you see oil temps climbing, or something like that. In autocross you go out and hope the car makes it through the run without self-destructing. 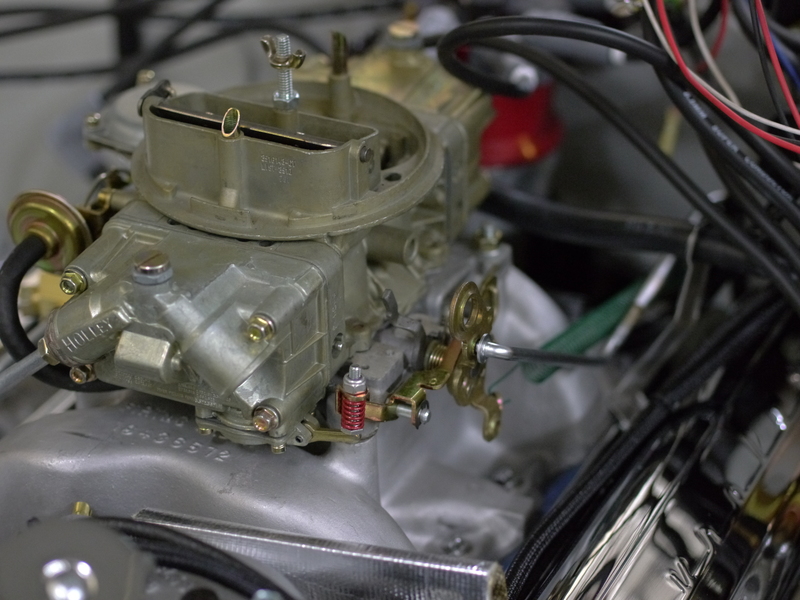 If you are having momentary drops of oil pressure, there's no way you'll see it, without some kind of alarm light programmed in, but that can be tricky, since 20psi might be OK at idle but death at 6k RPM. With the data acquisition, you're watching the gauges 100 times per second, and if there are any concerning fluctuations, they can be correlated to other events, like hard right-handers following a braking zone, for instance. In this photo it isn't yet talking to the DL1, so it only knows to output fuel level, which it will get from the main vehicle harness, and will not be datalogged. Common Camaro Lore dictates one most always autocross a first or second gen Camaro with a completely full gas tank. I'm hoping that's not actually the case, will find out soon enough. 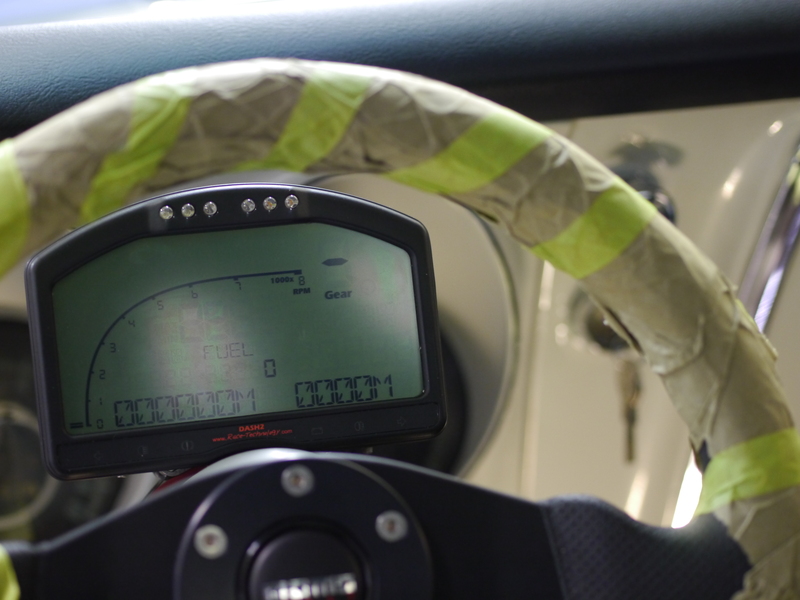 With the steering wheel in a normal position, eye level is slightly above the unit, which is supposed to be optimal for its viewing. Race-Technology was very supportive in sending me out a loaner so I could get the car fired up, while they send my bricked unit back to the UK for repairs. Thanks Al Seim and R-T USA! The plan for the moment is to get it running, and solid enough to not fall apart or puke its fluids out everywhere on a short drive. Want to make sure it builds oil pressure by free-cranking it with the plugs out, before they go in and I try to fire it. It *should* be fine as it ran great on the engine dyno, but that was over 2 years ago, and it has since received a new oil pan. It'll need to go to an interior shop to get the headliner put in (it's a least a 2-person, if not 3-person job on these cars), then to an exhaust shop (have some tweaks to the Magnaflow system I need/want), and to ProParts USA for some shocks. I want to have the car ready for the San Diego National Tour, which is a short three months away! 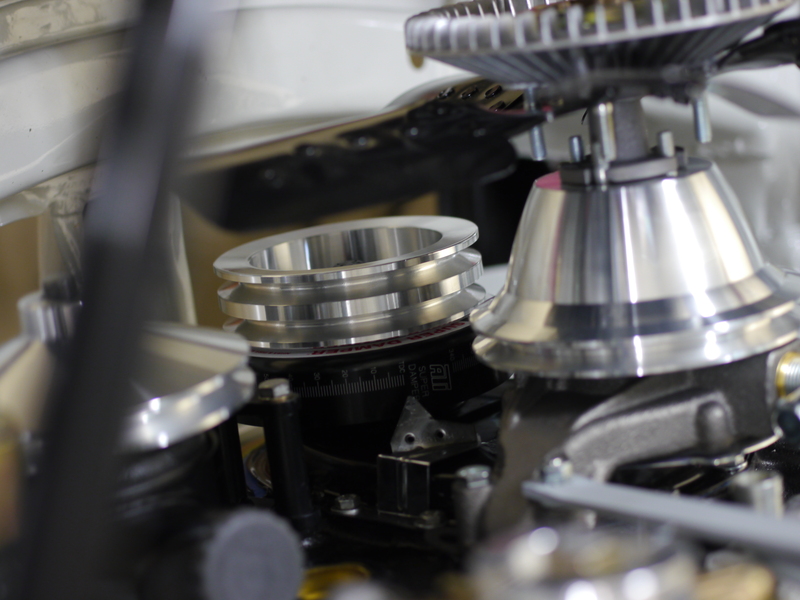 Some of the prettier aspects of the car should be coming together soon. 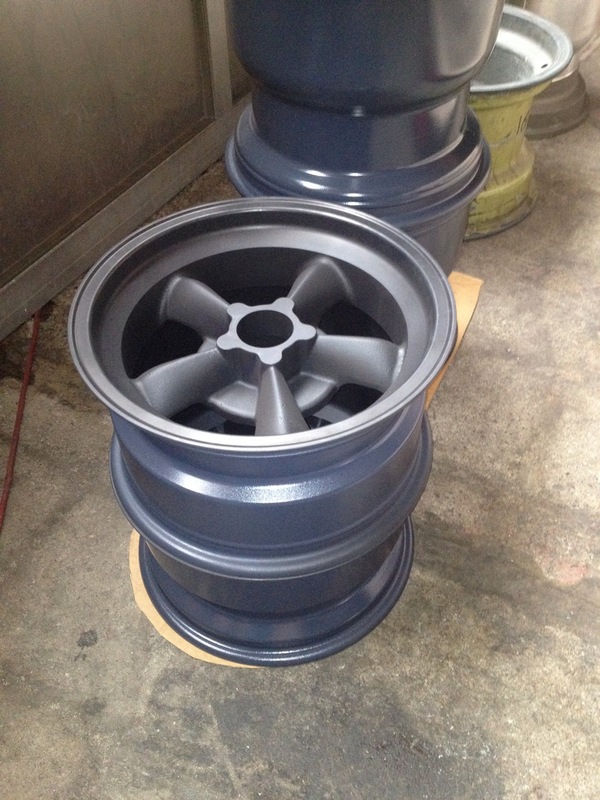 These first two are of the Vintage Engineering magnesium wheels, after coming back from receiving their DOW 9 coating. Ray at Vintage then drills for the Camaro bolt pattern, and removes the coating from the outer lips with a scotch-brite pad on a lathe. When done they look like the other two I've already received. When they're all here, will get the vintage-style Avons mounted up and put on the car. Those are just for the street and any show-type activities though. The ones below are the real deal race wheels. 18x9" Jongbloed 214 Aero, with custom backspacing, different front and rear. Jongbloed mounted up my first set of brand new shaved ST tires on those today, should have them this week. 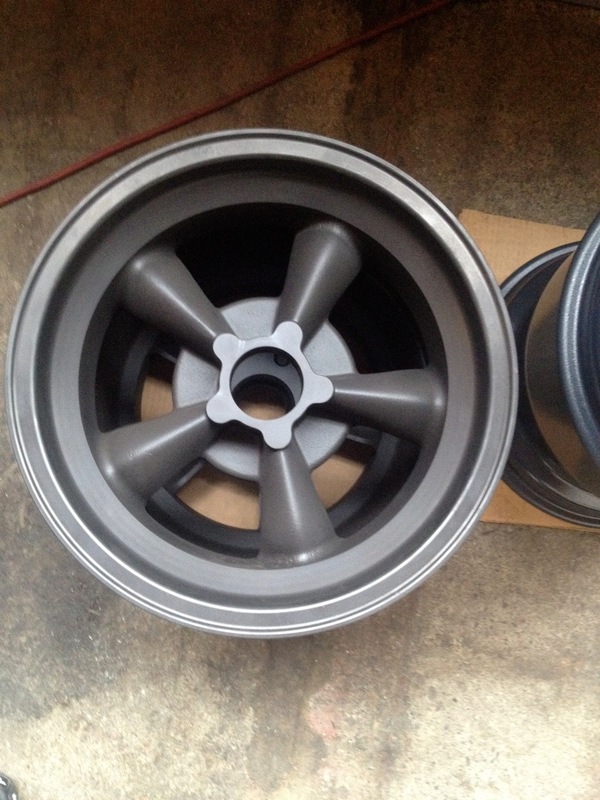 Congrats to Mike Heinitz for correctly identifying the wheel pattern after I showed them in process back here. Below are a few of the engine compartment, coming together, for real this time! 🙂 The March Performance pulleys look really great - they add a pop of shine without the obnoxiousness of chrome, and don't betray the simple mostly-stock, all-business look I'm after. With any luck I'll have some rollers on this thing for some out-in-the-driveway shots this weekend. 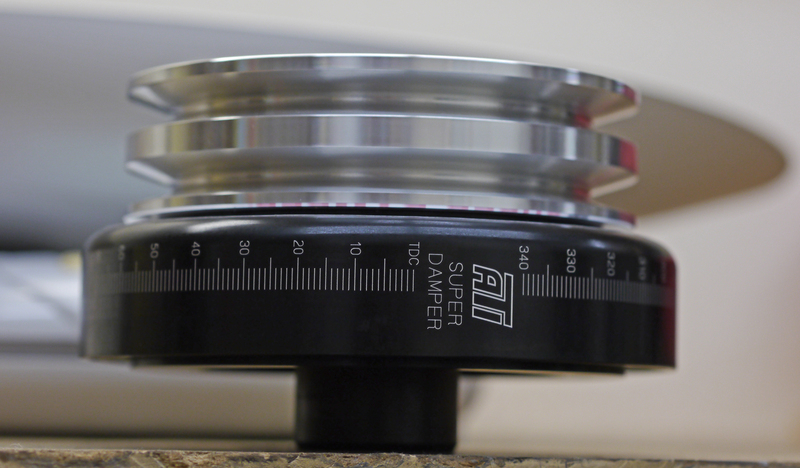 After a typically lengthy amount of research, ended up with a solution, an ATI Super Damper. 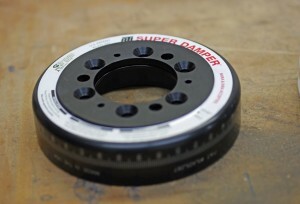 Now, it's not like there's one ATI Super Damper for a small-block Chevy. A search on Summit for a '67 Camaro returns 34 unique part numbers. Why so many? 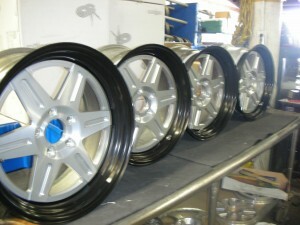 There are several choices you have for fitment. 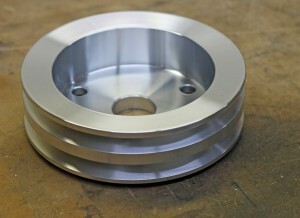 Starting with the hub, the piece that slides onto the end of the crank - you can go with steel or aluminum. Steel is a bit heavier, but a lot easier to make work. 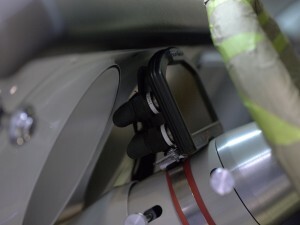 Because the damper relies on a tight fit to the crank, and the different coefficients of thermal expansion, the aluminum hubs essentially have to be custom-bored to fit most cranks. They also require more frequent inspection and replacement, and I'd come across at least a couple online stories of catastrophic failure. Ugg. Not something I'd be looking forward to. 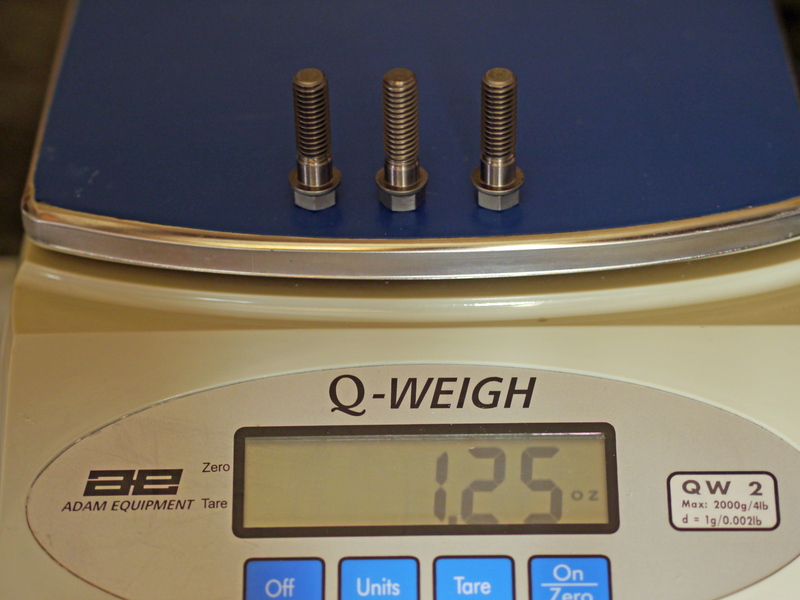 And while it would be lighter than the steel, most of that weight is at a very small radius from the crank centerline, so the impact on MOI (moment of inertia, the object's resistance to being spun), would be the smallest of these parts. 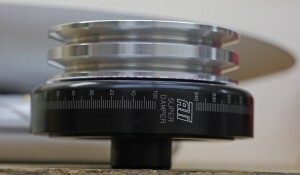 The dampers are offered in varying diameters, essentially 5", 6" or 7". The stock Z28 damper, which was a popular unit on all racing Chevy motors for a long time, is actually a big heavy 8" piece. Again, as with ring choice, the greater the radius of the damping elements, the more they can do to handle those crank harmonics. I made a compromise choice with 6". If the car was only ever autocrossed I might do 5", but I do plan to do the occasional track day too, where it will spend a bit more time at high RPM. The 7" unit would have been OK too but they don't seem to be stocked anywhere, and I wouldn't want to wait to have one made. Lastly, the metal used out between the elastomers, can be steel or aluminum. The steel options are significantly heavier than aluminum (8lbs. vs. 3lbs. typical), and reportedly don't offer much in the way of improved damping characteristics - mostly just less cost. Went with aluminum here. The above 2x2x3x2 only equates to 24 options - there are others for supercharged motors, weird offset items, things like that. A truly staggering array! Not sure exactly how underdriven this pulley set is. 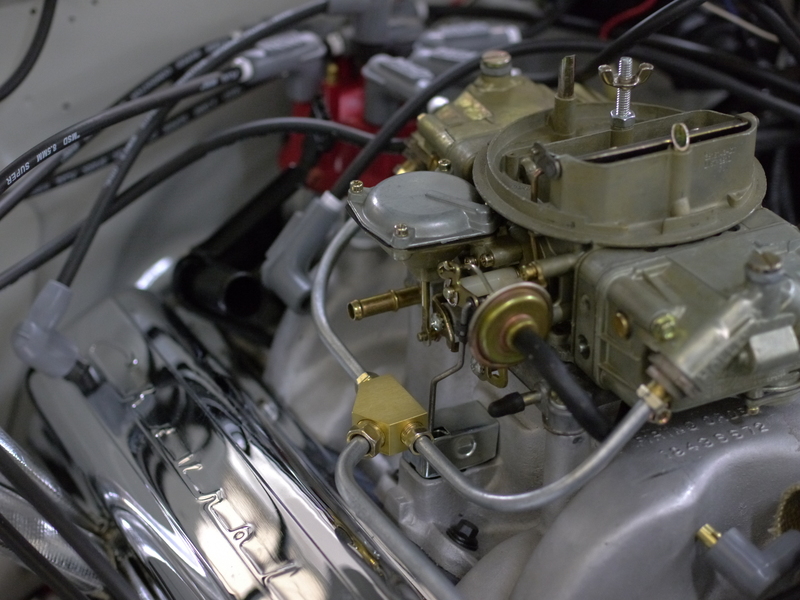 A plus side of the underdriving, in addition to "freeing up" some HP, is it tends to help keep the water and power steering pumps from cavitating at high RPM. Even though the 302 motors could spin fast, the ancillaries weren't always built to handle it well. So what holds those things together? 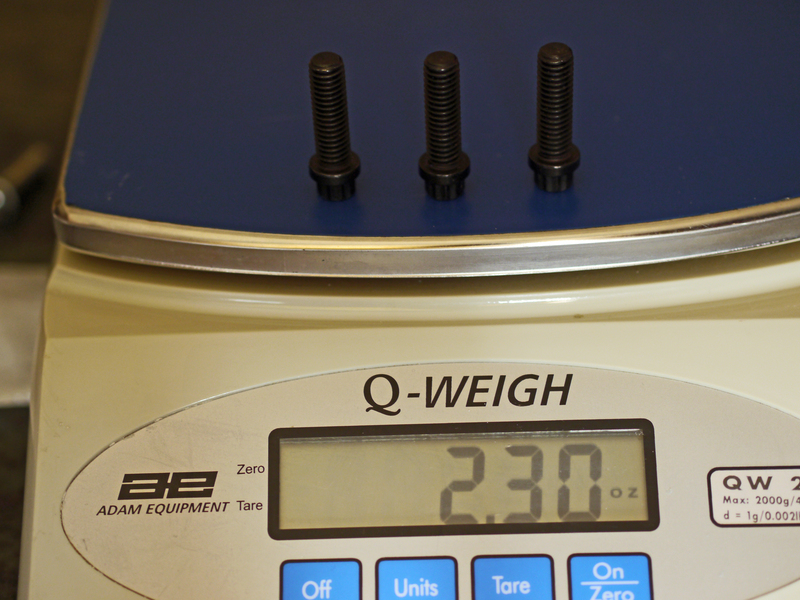 A few fasteners. One is the main crank pulley bolt, threaded into the crank itself, operating at a very small radius. 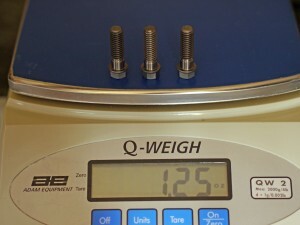 Additionally, there are three threaded fasteners, 3/8"-16 x 1.25". Pretty small and light units, but they're connected right to the crank, operating at a couple inch radius, contributing a good bit to the engine's MOI. Given that we're free to replace the crank pulley, means we're also free to choose what fasteners to use in holding in the replacement. ...1.05oz lighter! Over 45% reduction in weight, not too bad. 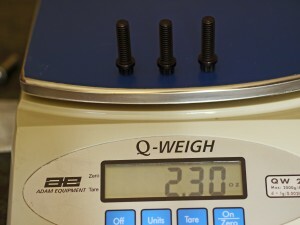 If one were to go through the whole car and replace every fastener with one of this material, in a just-long-enough length, bet you could save over 50% of existing fastener weight. On a car like this that'd be not insignificant - possibly 20 pounds. Still, I won't be running out to replace a whole bunch more fasteners, though with all the allowances in the class, there are quite a few which could be. Just wanted a little unobtainium in the car to give it a bit more of that cachet, and to see for myself what sort of real savings it could bring. A couple things conspire to make mounting the alternator in this car tricky. First, is the lack of allowance to change the mounting at all. 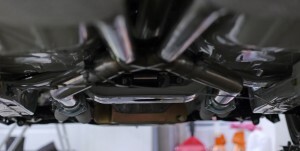 There are simple bracket kits out there to relocate it to the passenger side, which would help weight distribution, but of course this would not be allowed under our rules. The parts are available to reproduce that part of the alternator mounting, but one more challenge awaits. The picture here I borrowed from the site 67z28.com and the excellent photo restoration done there. 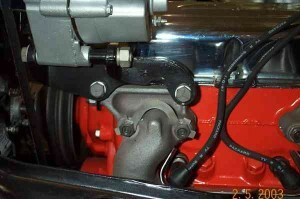 It illustrates how the alternator attaches to the engine at the bottom. 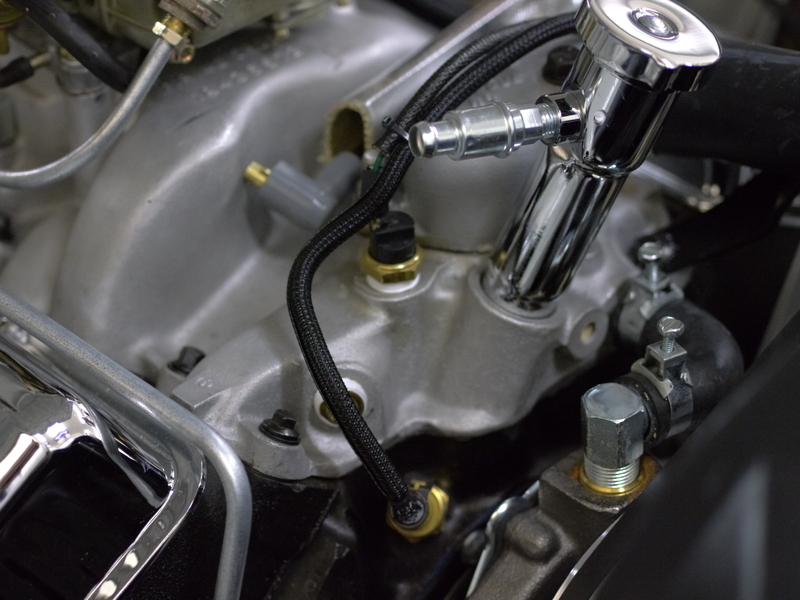 A cradle bracket, which affixes via two bolts, to a threaded part of the exhaust manifold! Arrgh. I have the black bracket pictured, but obviously my aftermarket headers are not going to have the provision to attach that bracket. I'll need to get the precise factory measurements, and modify my Swain-coated headers (due to arrive back tomorrow) with an additional welded-on piece, to allow me to hold the alternator bracket in this exact same way. Funny thing is, I've seen some pictures of the headers originally offered with the early Z28s, and they had that part on there, a simple rectangular bit welded to the flange.